Images derived from old photographs, oral histories, and interviews capture stories and memories of families who lived in the Tortilla Flats neighborhood, which was demolished in the 1940’s to build the 101 freeway. 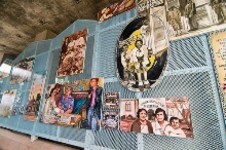 The murals reinterpret a temporary Tortilla Flats mural (1995 to 2000) across from the Ventura County Fairgrounds. Artists: MB Hanrahan & Moses Mora.